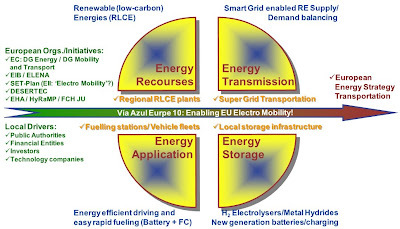 The Main challenge for the Electro Mobility is the efficient distribution (Smart Grids) of electrical energy from increasing Sustainable Energy Resources all over Europe to end-consumers (public and private) in the transportation sector, while simultaneously maintaining an energy supply/demand balance, through local energy storage, for asynchronous mobile applications. 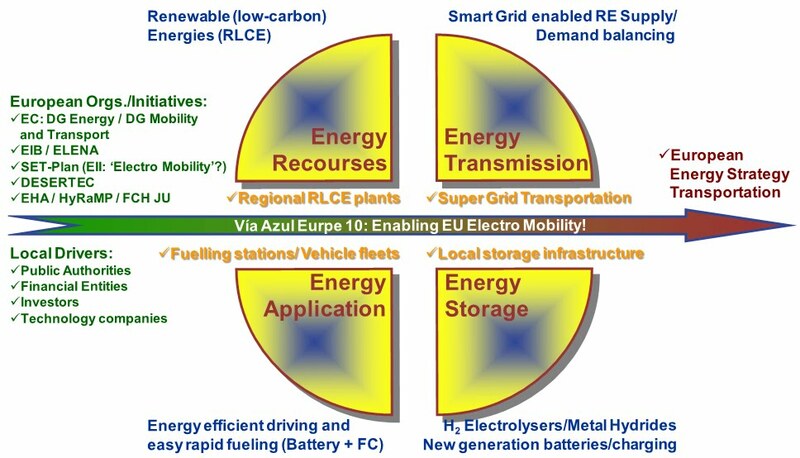 The ‘Via Azul Europe 10’ is an initiative concept for an European Highway Network of a new Filling Station generation, providing facilities to reload energy storage utilities in vehicles with Electric (Batteries and Fuel Cells) and Internal Combustion (ICE-H2) Propulsion. These Filling Stations will be wired by a Smart Grid. The Smart Grid will be realized through Highway Cables, a reasonable mixture of HVCD (high-voltage, direct current) and HVAC (high-voltage, alternating current) power transmission technology, connecting the Filling Stations with ever-growing Sustainable Energy Resources (Solar Thermal Power plants, Wind Power plants, Hydro Power plants, Biomass Power plants etc), distributed all over Europe. The Smart Grid will be extended by an Energy Dispatching WAN-IT-Network, to assure real-time information exchange about decentralize energy generation vs. local demands, to enable an anti-cyclic consumption optimization corresponding to the networks electrical energy capacities. The name Via Azul (Azul = Blue: Similar to iea ETP 2010 BLUE MAPs (-50% CO2 emissions by 2050, vs. 2000, to limit global warming at <= 2oC) and “Blue” Hydrogen) was derived from the Fuelling Station Network capability, to act within the Smart Grid as Point of Local Energy Storage. The Energy Storage will follow the concept “Energy Vector Hydrogen”, realized through local Electrolysers, transforming the Electrical Energy (Smart Grid) into locally stored Hydrogen (Chemical Energy).If the Energy Transformation will be performed preferably during daily Energy overcapacity periods on the Smart Grid, this will enable reliable and Best Prices for the combustible Hydrogen, used in Long Distance Electro Vehicles with Hybrid propulsion ( Fuel Cell) and in Long Distance Vehicles with Internal Combustion Engines (ICE-H2). The Hydrogen stored Energy can be provided as well, through stationary Fuel Cells at the Fuelling Stations. The electricity, can be provided directly by the Smart Grid. The Energy Vector Hydrogen combined with intelligent Smart Grid Dispatching facilities will enable a stable Energy Equilibrium for the European Transportation Sector - based on continuously balanced Electrical (Smart Grid) and Chemical (Hydrogen storage) Energy. The BENEFITS FOR EUROPEAN ECONOMIES will be tremendous, not only in AUTOMOTIVE AND THE SUSTAINABLE ENERGY SECTOR, but overwhelming in the SECTOR OF TRANSPORTATION, the bloodstream for each economy. The common benefits would be even more groundbreaking, when the Smart Grid will be connected with DESERTEC resources, providing high pike energy generation cycles during shifted time zones. There are various approaches to enable the European Rollout of the Electro Mobility, as a common Investment into the local market Development and prototyping dedicated for future global Application. The "Via Azul Europe 10" initiative is a promising one of them..!